No two people see the same New York City, San Francisco, Paris or Las Vegas. Some will remember the skyline, with its endless skyscrapers, carving out a clouded sky. Others will prefer the museums, with that breathtaking piece of artwork they thought they’d never see. These cities — much like our own — are playgrounds, where individuals are left to gather fragmented memories and impressions. Montreal, for instance, is a city with a remarkable use of public space. It can be said that we are, above all, a showcasing city. The very existence of these spaces, crowded with artistic installments and festivals at all times of year, is constantly inviting people, either citizens or tourists, into discovering our city. An excellent example of our city’s showcasing endeavors is this year’s returning edition of Art Souterrain, which will be running from March 2 until March 17. This artistic event is put together by an organization of the same name, which was founded in 2009. The Art Souterrain organization’s mission is to make contemporary art more accessible to all and to give it a chance to be appreciated as a whole. Art Souterrain, in 2013, is the fifth edition of this impressive event, as this year’s circuit spans over seven kilometers. Artists’ creations always focus on one curated theme in order to create a cohesive circuit for people to explore. This year’s theme is the labyrinth: “a sinuous plan, provided or not of crossings, dead ends and false tracks, intended to slow down or get lost someone who tries to walk through it,” as it is eloquently explained on their website. They are, however, quick to underline the symbolic sense of the theme as well; the labyrinth also references the understanding between the spectator and the artist and how the former will lead audiences through a series of movements and ideas to a new vision or perspective. For people interested in completing the circuit as a whole, the downtown Montreal area has been divided into eight zones. They all host a respective amount of artists, based on whatever space is available. This includes “unofficially” parts of the STM, as well as more official venues such as Palais des Congrès. 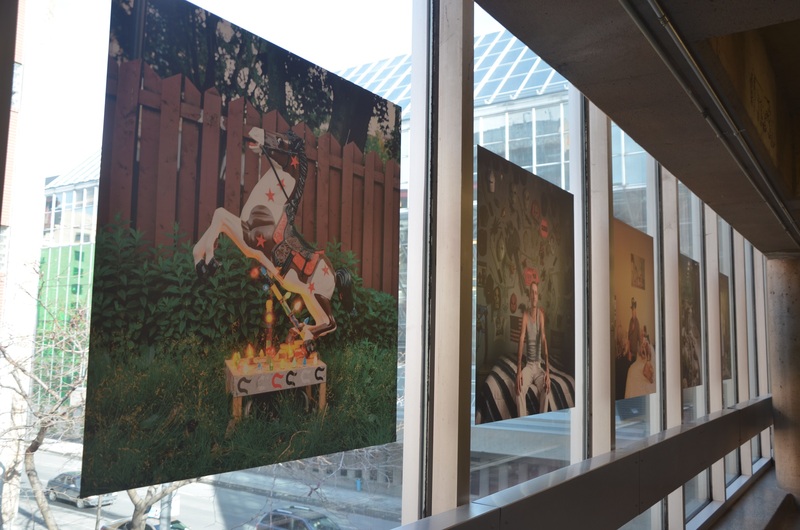 As an organization, Art Souterrain has the more “local” goal of encouraging Montreal to renew its stance on visual arts. The same way it has actively decided to advocate its importance in the music world, be it on the local or the international scene, Art Souterrain would like Montreal to take an active role in promoting contemporary visual arts. What visitors of the event will quickly come to understand is that Art Souterrain wants to create a sense of pride and appreciation for the visual arts, that has been but an undertone in the city until now. This major artistic event also fosters the notion of ‘guest city’. Essentially, the organization partners with another major city from around the world in order to invite some of that city’s newer or more prominent contemporary artists to come and exhibit their work. This year’s guests were from Barcelona, and have been greatly influenced by a combination of both Catalan and Spanish artistic techniques and themes. Art Souterrain is an invitation for Montrealers to take the time to enjoy a spectacle. After all, part of the city has essentially been temporarily revamped to take your breath away. Why not go take a walk and let it surprise you? Art Souterrain will be taking place across the downtown Montreal underground March 2-17. There are no admission fees related to this event. For a detailed map of the circuit and for more information visit http://www.artsouterrain.com/en/home.